With licensed Professional Engineers on staff, Alta offers a unique blend of skills to produce intuitive, safe, and comfortable to use solutions, from concept to implementation. Our staff bring multi-disciplinary expertise in greenway design, complete street and streetscapes, traffic analysis and signal design and high quality bikeways. Alta considers every detail during design to provide our clients with affordable and thoughtful striping and signage solutions. Alta offers a unique blend of skills to produce effective and high-quality streetscape solutions, from concept to implementation. 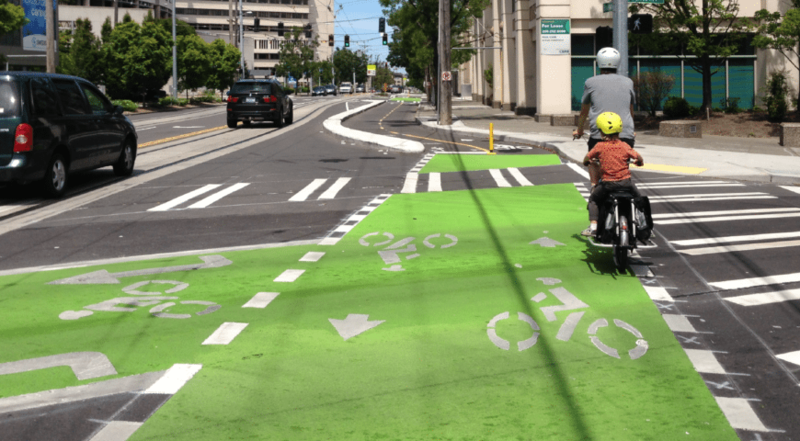 Alta helps communities plan and implement bicycle boulevard corridors and neighborhood greenways on lower-volume residential and collector streets. Good intersection design has progressed rapidly in recent years with features that make them safer and more comfortable for bicyclists and pedestrians. Alta has helped dozens of communities advance and build non-motorized barrier crossings by providing a unique blend of services that spans all project phases. Alta combines guidance found in more traditional resources with local standards and academic researchs to create a single visually-rich document that can be used to lead the design of bicycle and pedestrian facilities.